Sometimes, managing volunteers at a conference can feel like herding cats. However, a little preparation beforehand, and the creation of a simple document, can help things run a lot more smoothly onsite. Why do I need a Conference Volunteer Guide? Volunteers are incredible. They’re so passionate about your association and its work that they’re willing to share their time and expertise to further your mission. However, as organizers, we need to remember that volunteering at an event can be an intimidating experience. Volunteers may be experiencing a lot of firsts like meeting other volunteers in person, visiting the host city, seeing the venue, and even helping at an event. It’s a lot to take in! Emailing a Volunteer Guide (or a packet of relevant information) to the volunteers at least one week beforehand will allow each volunteer to become familiar with all the information they need to know before arriving onsite. What needs to be in the Volunteer Guide? 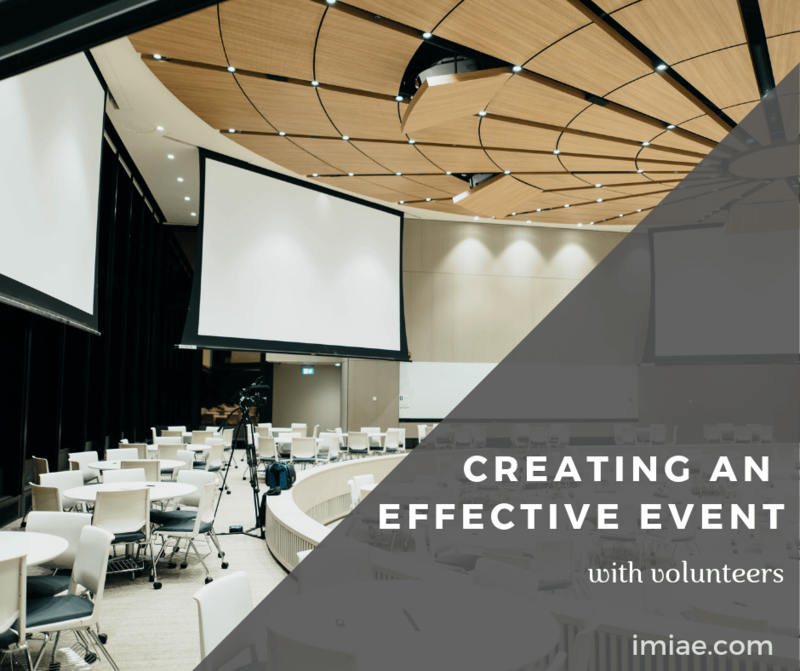 While there may be additional items you’ll want to include for specific events, these seven pieces are vital to any Volunteer Guide. All this information is key for volunteers to know so they can help you pull off an amazing event. Is creating a Volunteer Guide worth it? Though adding yet another item to your conference to-do list sounds impossible, you won’t regret carving out the time to create this packet. You may already have all of this information prepared; it’s just a matter of combining it into one PDF. At IMI, we have used this helpful tool for many of our clients, and it always allows things to run more smoothly on site. We’ve found the packet allows volunteers to feel more confident and take ownership of the event. We highly recommend trying it out for your next conference. Has your organization used a Volunteer Guide at past events? Is there anything else you include in your packet? If you’re tired of managing chaotic events, why not contact IMI? Our team takes the stress out of managing your conference and creates a successful event. We manage all the details so your association’s board and committee can focus on important strategic initiatives. A year ago, I transitioned from the fashion industry to the association world. In some ways, it is hard to believe that it has only been a year and in other ways I feel like I have been doing this for a long time. I had never heard of association management before I came to IMI. A board of directors was nothing more than a vague business term I’d heard of previously in business classes when talking about stocks and IPO. Little did I know how much I would love what I am doing and how my past work experience would have prepared me for this career. I have worked for a lingerie designer, a network service provider, a women’s activewear startup and an up and coming fashion lifestyle brand. I learned valuable skills at each of these positions that prepared me for what I am doing now. I’ve also had a lot of on the job training that no amount of studying or schooling would be able to replace. In an association management company (AMC), it is all hands on deck. Each staff member contributes from the wealth of their experience and all of our clients benefit. When professionals come together to form an association for their industry, they are busy working in their careers. They don’t have the time or the means to do all of the behind the scenes work that an AMC provides. I’m using my experience to help that non-profit succeed. Now, I am attached to the outcome. We can easily see how our diligent efforts are turning into measurable success for the non-profits – and their success is our success. While the association world can be stressful, my job is exciting and changes enough that I don’t get bored. I spend months planning a conference that lasts only a couple of days, but being a part of the end result is incredible. My work before seemed just like a job. For the first time, I feel like I am able to make a difference. The most recent conference I planned, we had a session about Accessibility. Through that conference session, we’re helping companies all over the world make their websites and digital products accessible to those with disabilities. Talk about impact! Associations provide education and best practices to the industries that they represent which in turn leads to better products and services for consumers. It’s hard not to get excited about being an integral part of making the world a better place! Wondering how an AMC could support your non-profit? Contact us today! The new year is quickly approaching which means setting new goals is probably on your mind. But when there are so many things your non-profit wants to accomplish, how do you choose what to focus on? Several years ago, I was personally inspired by Lara Casey to choose a word of the year. This one word, usually picked in December, is meant to help me set my intentions for the new year. Since starting this practice, I’ve found that returning to my one word throughout the year is incredibly helpful. It keeps me from setting goals I feel like I should set, and helps me create resolutions that truly mean something. This method works well for associations and non-profits to find focused goals, too! It helps groups move past the surface level goals, and allows you to uncover the deeper reason behind the things you want to accomplish. While picking just one word for 365 days’ worth of goals sounds difficult, Casey provides several questions, which are easily adapted to suit a non-profit, to help us get started. What kind of presence do we want to have in our community this year? If we could envision our best year yet, what would that look like? Where do we want the association to be in 50 years? 2019 is the year we ______. Through answering these questions, a general theme will begin to emerge. Once you recognize this theme, pick three or four words that resonate with it. Then, Casey recommends to get old school and pull out the dictionary to look at the definition of each word, its origin, and its synonyms and antonyms. Finally, pick the word that you feel best encapsulates the theme revealed through your answers. Now, remember this word when creating goals for 2019. Don’t pull goals out of thin air, and don’t plan to do something just because you see your competitors doing it. Return to your word. It will help remind you of the WHY behind what you want to accomplish and allow you to create goals that get to the heart of your organization. Has your organization ever picked a word for the year? How did it go? If your association is too bogged down by every-day tasks to focus on its bigger mission and goals, then contact IMI Association Executives! We are a firm of skilled professionals whose goal is to provide management expertise along with specialized administrative services to associations, societies, and other non-profits in an efficient, cost-effective manner. Submit an RFP today. Tchotchkes. Doodads. Swag. If you’re a regular conference attendee, you know that these terms describe the stress balls, t-shirts, pens, and other assorted items available at vendor booths in a conference’s exhibit hall. While the exhibit hall is a place to load up on office supplies, it is more importantly the location where topic-specific vendors can share information about their products. Because not every attendee has the need for color-changing cups or the desire to talk to vendors, it is common for conference planners to provide an incentive to visit booths. One of IMI’s clients, the National Association of Professional Background Screeners (NAPBS), has used an exhibitor bingo card as an incentive in the past. Upon registration, attendees were given a bingo card with squares to be signed by vendor representatives as attendees visited their booths. Attendees returned the filled card to the conference registration desk and were entered to win a prize. The bingo card has successfully encouraged attendees to talk to vendors; however, it has been utilized frequently in the past and for its 2018 Annual Conference, NAPBS wanted to do something fresh. In the 15 years since it was established, NAPBS has grown from a U.S.-based trade association to an international alliance of professional background screening firms with the mission of advanc[ing] excellence in the screening profession. In early October, NAPBS members from the United States and its Europe, Asia-Pacific, and Canada Chapters gathered in Baltimore, Maryland for its 2018 Annual Conference. This year’s conference theme, “Passport to the World” reflected NAPBS’s transition from representing national to international background screening firms and consumers. In alignment with their theme, they forewent the exhibitor bingo card for a booklet modeled after the universally-recognized U.S. passport. This booklet, called the Passport to the Exhibit Hall, reminded attendees of NAPBS’s international presence and provided an innovative way to engage with exhibitors. At the conference registration desk, NAPBS staff asked attendees if they were interested in playing the Exhibitor Passport Game. They showed attendees the passport and explained that at each booth, attendees could get a square “stamped” by the corresponding vendor, just like going through customs on a jet-setting adventure. In an educational twist on rubber stamps, NAPBS distributed sheets of stickers to exhibitors which were printed with facts about the background screening industry to educate participants as they moved from booth to booth. To be entered into the prize drawing, participants had to visit at least half of the 50 booths and return their Passports to the registration desk on the last day of the conference. Staff at the registration desk noticed increased interest and participation in the exhibitor passport game than in exhibitor bingo of past years. In fact, when some attendees brought their passports to be entered into the prize drawing, they asked if they could keep their passports as mementos, valuing the facts which had been “stamped” inside. This is great news for NAPBS as it means that its vendors received good traffic in the exhibit hall. Also, the conference experience will be shared with industry professionals as returning attendees share their passports with coworkers. 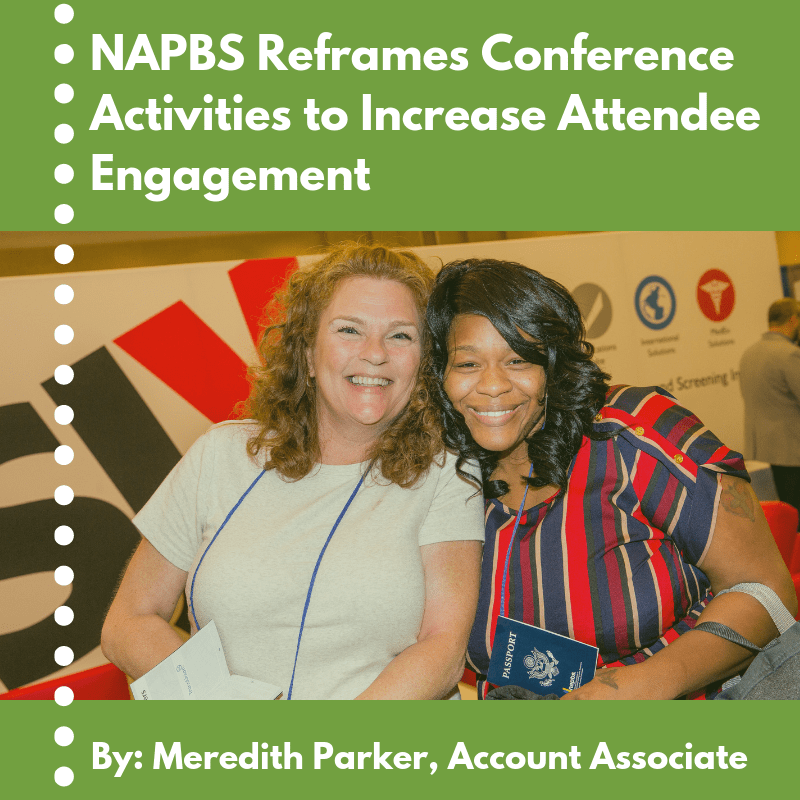 The overwhelmingly positive response to the exhibitor passports was unexpected, and NAPBS is thrilled with the way that a simple tweak to an existing conference activity has given them and their vendors more exposure. They are already pondering how to add a creative spin to other conference elements to engage attendees, further their theme, and execute their mission. Have you attended or facilitated a conference that found a new way to make attendees excited about conference programming? Leave your comments below. If IMI’s integrity, empathy, emotional intelligence, vision, judgement and passion – all qualities essential to working successfully with non-profit organizations – aren’t enough, what else compels organizations to engage IMI in ensuring their future success? Experience: IMI’s team has 170+ years of combined non-profit management experience and expertise ranging from strategic planning and leadership development to finance, membership, marketing and communications, meetings and events, fundraising and all things in between. There’s not a non-profit situation or challenge IMI’s team hasn’t confronted and successfully met. Optimal Size: IMI is a medium-sized association management company that is large enough to support clients’ needs, but small enough that they each receive individualized service and benefit from IMI’s collective expertise. 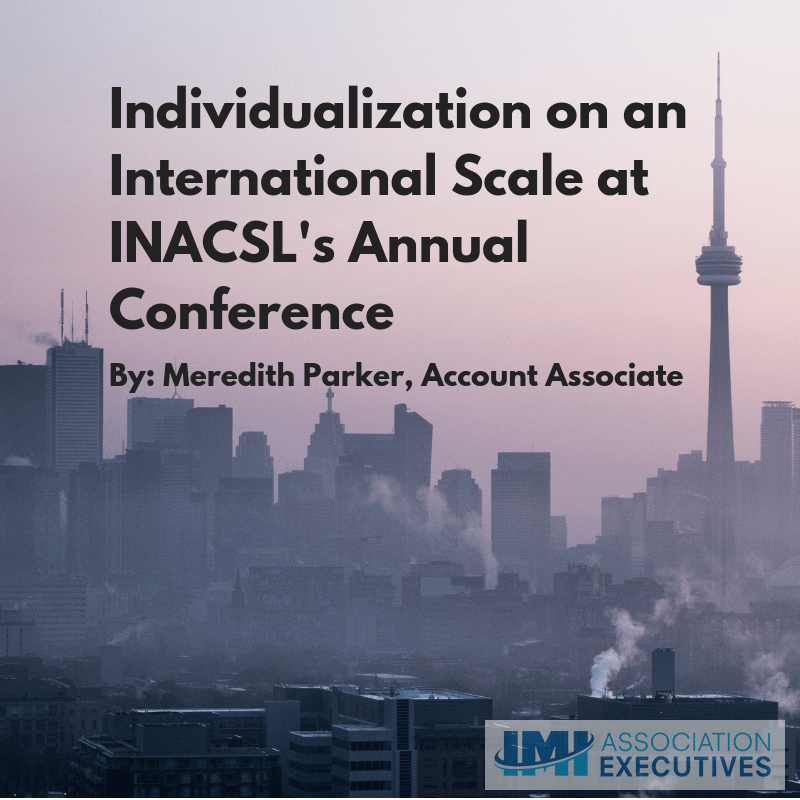 Individualization: Each client is assigned an account team of IMI employees that best fit the needs of the client. Specialists are drawn from a pool of personnel resources and are assigned on an as-needed basis to projects. We work with our clients continually to ensure that they are fully supported in the way that best develops their goals and objectives and meets their members’ needs. Team Approach: Since IMI’s company philosophy advocates a team orientation to the workload, IMI clients have the added benefit of getting to know, and being known by, multiple employees within the company. For all projects, multiple people are involved from concept to completion so work can continue uninterrupted in the event that a team member is unavailable. 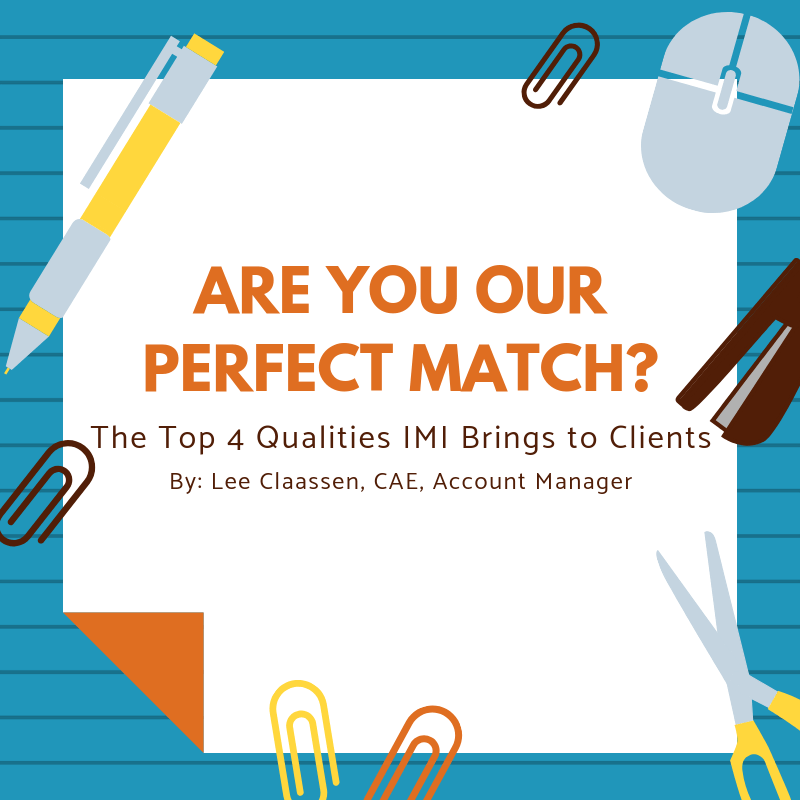 With 35 experienced employees, IMI provides exceptional customer service and a highly personalized approach to each client; in fact, we would tout that attribute as the single most important reason for the success of our clients. While we have great respect for the business needs and member satisfaction of each client, IMI clients are also our friends and we wouldn’t want it any other way. Are you interested in learning more about what IMI can do for your non-profit? Email me at lee@imiae.com for more information. IMI has always been an open, dynamic and collaborative organization. 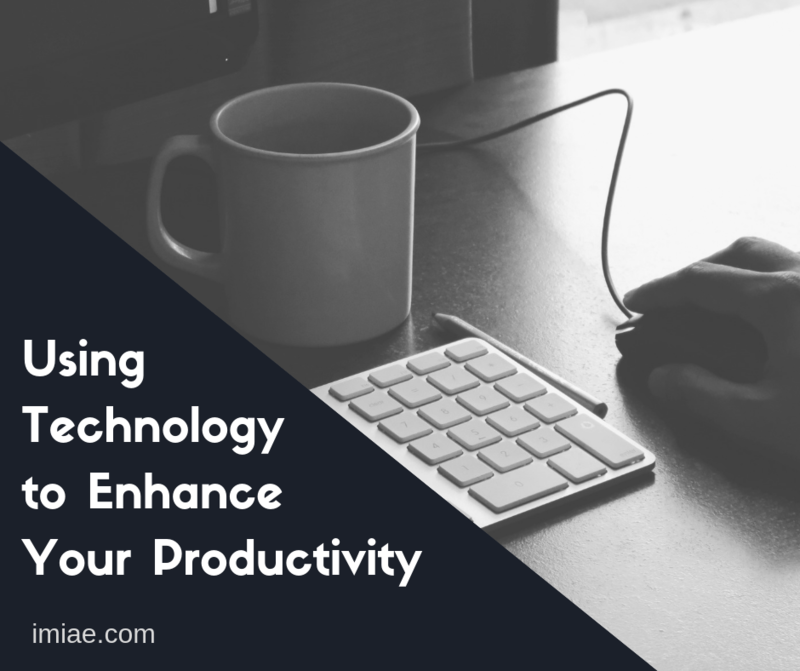 We aren’t content to simply sit back and foresee hurdles or potential challenges; rather, we believe in taking the proactive approach of seeking solutions and finding ways to overcome them. IMI employees demonstrate this philosophy in their daily routines; while working with clients; and through the sharing of best practices, insight and industry knowledge online. 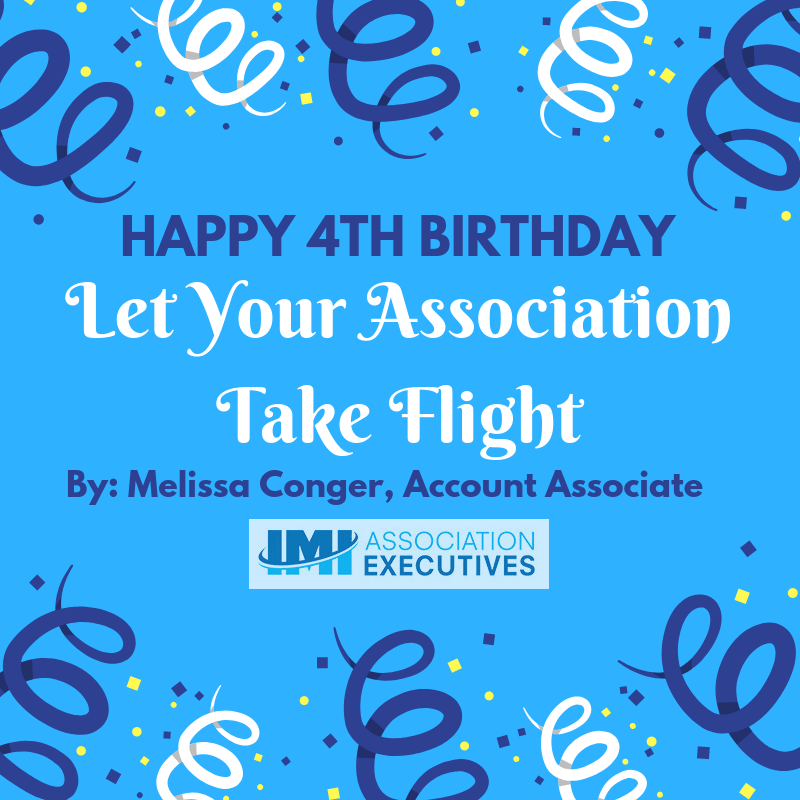 We get excited when we consider how far along our blog has come since it took flight, and the many adventures IMI will be experiencing and sharing with you in the future! 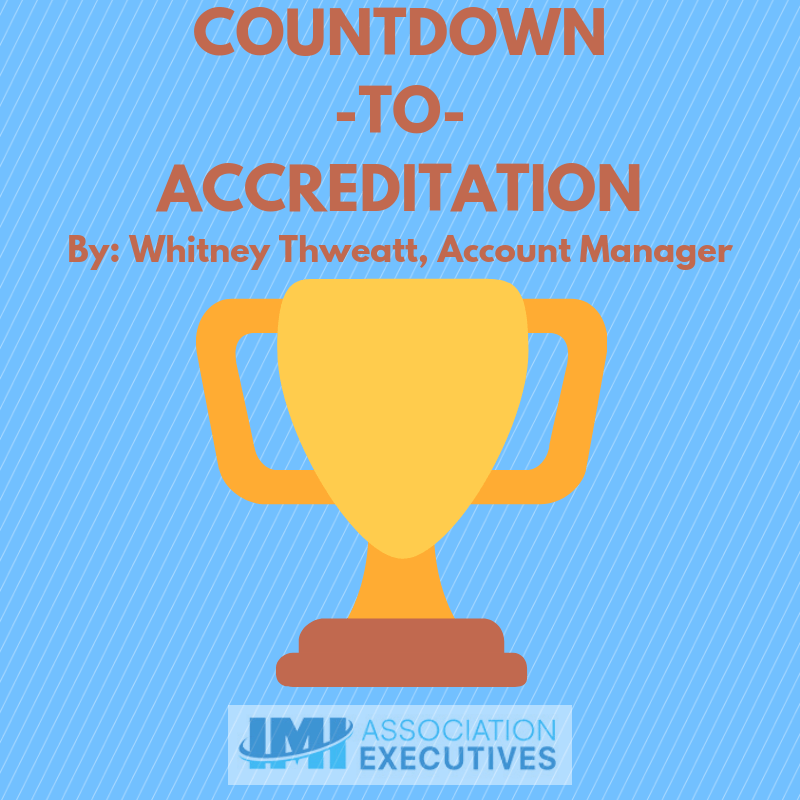 IMI recently checked off one more item of the list on our AMC Institute accreditation poster and is only a few steps away from completing the accreditation journey. As an effort to demonstrate our company’s commitment to quality, service and excellence, as well as employee training and education, IMI is pursuing accreditation from the AMC Institute. Why? By achieving accreditation status, we are ensuring that best practices are documented and woven into our processes consistently across all clients. Current clients will feel confident that we maintain the highest standards. Communication will be ongoing with clients to ensure all services are provided in an effective and efficient manner. By successfully completing the accreditation process, we can establish a basis for benchmarking and enhancing established documented internal controls and operating systems, as well as identifying greater efficiencies and quality control procedures. Over the past several months, IMI staff has been hard at work reviewing internal processes, policies and procedures to see if they fall in line with the Standard, compiling all documentation of our internal systems and processes, and updating or creating any policies necessary. We recently completed staff training on all company policies and Standard sections. The final step prior to scheduling a third-party audit is to conduct an internal audit to ensure we’ve adopted all practices that we have created. While it has been a long and arduous process, it is one that will greatly benefit both IMI and all of our client partners. The last item on the accreditation checklist poster? “Hold an accreditation party!” Stay tuned to hear how we’ll celebrate!